The spinach, chard, kale and other leafy green seedlings we started in October are growing extremely slowly. They are so small that we have to keep digging them out from the pine needles and leaves our trees are constantly dumping on the garden. The dramatic temperature fluctations we have been experiencing here in Texas are certainly not helping encourage seedling growth. Amazingly, our Asian greens are still flourishing. These greens seem almost indestructible. We selected varieties that were developed for hot, tropical climates, and they produced heavily all summer. We didn't expect them to survive once the temperatures dropped, so we have been pleasantly surprised that the plants are not only alive but thriving. Although bred for heat, these greens are truly year-round vegetables for the Zone 9 garden. If you live in a climate similar to ours, we strongly encourage you to include these greens in your garden next year. If you want to learn more about the greens we are growing, click here. Evergreen and Kitazawa both have excellent seed selections. Since spinach from the garden seems but a distant dream, we are grateful for the abundance of Asian greens. We have already used them to make delicious Lebanese Pies, Pasta with Goat Cheese and Eggplant and Spicy Tofu with Asian Greens. Asian greens are an excellent substitute for spinach in all these recipes. 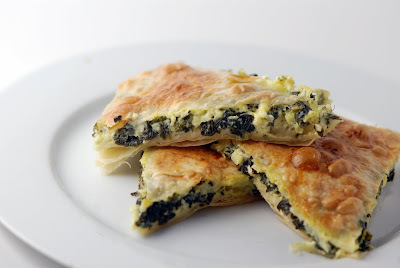 Here we use Komatsuna and Misome to make Turkish pies similar to spanakopita. Thanks to Mae of the wonderful site, Peas Love Carrots, we now have a name for our pie -- Hortaropita. As Mae writes, "it's a phyllo pie dish (pita), but not using the traditional spinach, but other "greens" (horta) instead". Not traditional, but tasty none the less. Preheat oven to 350° convection (375° conventional). Blanche the greens in boiling water. Drain, squeeze dry, then chop. Heat 1/4 cup olive oil with 1/4 cup butter over medium, then add greens and scallions. Cook briefly, stirring (about 2 minutes). Let greens cool, then add feta, 2 eggs, and parsley. Combine well. Add salt and pepper to taste. In a pyrex measuring cup (or something with a spout), combine 1/4 cup melted but cooled butter with 1/3 cup whole milk, 1/4 cup olive oil, and 1 egg. Mix well. Spread a tiny amount of the butter mixture on a sheet pan, then layer 1 sheet of filo. We pour the mixture on with the measuring cup, then spread with the back of a spoon. You can also use a pastry brush if you have one. Layer a single filo sheet on the buttered sheet pan, then spread a little more of the butter mixture on top of the filo. Repeat until you have 10 layers of filo dough. 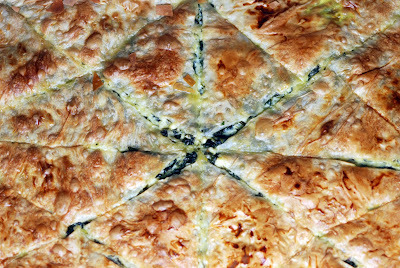 Spread the mixture of greens and feta on top of the filo dough. Evenly distribute. Use rest of filo dough to make a top for the pies, repeating the process of layering a single layer of dough, spreading butter mixture, then adding another layer of dough. Mix 1 egg yolk with 1/8 cup whole mik, then use this as a glaze to cover the top layer of filo dough. Before putting into the oven, cut your pie into triangles. We used a pizza cutter for this, and ended up with 20 triangles. Bake for 20 minutes, then lower temperature to 300° convection (325° regular) and bake until top is browned and flaky. I was wondering why my lettuces were so small and thought I might have done something wrong. It's good to know that it's just Texas weather being stupid, not me! How I love the lightness of phyllo dough and how lucky you are to still have veggies growing in your garden. This looks like a great use for them. It looks like a great lunch dish! I love anything with lots of vegetables. This recipe looks absolutely delicious! I haven't worked with filo dough too often, but I'd love to give this a try. My word these look good. Tell me more about your Asian greens. Are they bitter, or are they more subtly flavored, like spinach? I'm wondering if I could grow them in Dallas - while it's much colder than Houston, maybe we're still warm enough? I think this clever recipe could be coined "hortaropita" as it's a phyllo pie dish (pita), but not using the traditional spinach, but other "greens" (horta) instead. Asian green grow well here also in our zone 6 garden. They are truly versatile in the kitchen, I've even made soup with them. The Hortaropita sounds wonderful, we'll have to give it a try! What an awesome recipe! I'll have to try this one, soon! I am really craving things like this after all the Christmas food we've had. Not that I don't like roast potatoes and cheese boards, but you know... Something else would be good. I made a torilla for dinner, which I thought this was when I saw thw photo, but seeing that it has filo in it makes it much more exciting! Delicious and a thing of beauty! This looks so wonderful!! I want some! I would love to have fresh greens! These look wonderful! Wow, you have abundant greens in your garden. What a great way to make it into a pie. MMMMMMMM,...these filled pastries look golden & ooh so marvellous!! Mmm, for some reason this makes me think of summer. So I will stare at it and then make some and then stare at it some more ... because, girl, it's cold outside. Spanakopita was one of the first things my parents didn't have to force me to eat. I subsisted entirely on Kraft singles and tomatoes the year I was 3. Then they took me to a Greek festival and BAM, I was hooked. Am still a major fan, and this looks like a delicious variation! Will have to convince the farm where I volunteer to plant some Asian greens. Thanks for sharing. I love spanakopita, and the Asian greens add a nice twist! Aw! I feel like a godmother for this recipe now. :) I will have to send a birthday present every year to little Hortaropita!